Gunn Memorial Library provides free wireless internet access inside the Library building. The wireless network is not secured and is unfiltered. Information sent to or from your laptop, tablet or phone can be intercepted by a third party. Credit card and other financial transactions or any transmission of personal information such as a social security number is best done on a secured network in a non-public environment. We recommend that you keep your operating system updated, maintain virus protection, and disable file and print sharing where applicable. Library staff cannot make changes to your computer. For more detailed information, please check with the manufacturer or supplier of your equipment. You are responsible for virus protection and other security configurations on your personal computer equipment. The Internet and its available resources contain a wide variety of material and opinions from varied points of view. Users need to be good information consumers, assessing the validity of the information. The Library cannot be held responsible for the accuracy or reliability of information or any improper use of our electronic resources. Patrons should be aware that material available on the Internet is not censored or filtered. Parents of minor children must assume responsibility for their children and the material they access. 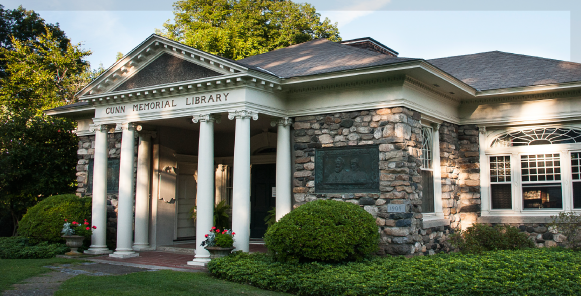 The Gunn Memorial Library assumes no responsibility for any damages, direct or indirect, arising from use of its Internet services or from its connections to the World Wide Web. All computer users must have a valid library card. Computer users must sign in and out at the Circulation Desk. Library staff’s availability to assist users with Internet access is limited. Users should have basic computer skills. Internet instruction is available; please check at the circulation desk. Access to the Internet is limited to 30 minutes per session. If no one is waiting, patron may continue to use the Internet for an additional session. There is no charge for the first five pages of printing. After that pages can be printed at a cost of 10 cents per page. Users may not add bookmarks. Users may only download files to a USB, which may be purchased from the Library if needed. Students under the age of 15 may use the Internet if they have a library-generated permission slip on file. Please ask at circulation desk for further information. Children under the age of 6 may not use the computers unless supervised by a parent or adult guardian. The Gunn Memorial Library cannot assume responsibility for the content of the Internet, as it is unable to control or monitor the information that is available. Any misuse of the computers may result in suspension of privileges. Patrons may send e-mail; however, privacy and security cannot be assured.